excellent location, breakfast very good. near everything. Where to find Parkville hotels near an airport? Where can I find hotels in Parkville that are near tourist attractions? If you're seeking upscale or affordable long-stay or short-stay accommodation in or near Parkville, it is useful to know that Expedia offers many different possibilities. Expedia's extensive database lists 384 accommodation options that are within a 0.1-kilometre (0.06-mile) radius of central Parkville. Those looking for accommodations conveniently located to the heart of Parkville, should check out the latest offers at the Apartments on Chapman and Naughtons Parkville Hotel. 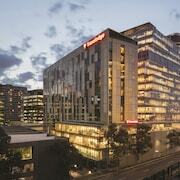 The Park Hyatt Melbourne and the Melbourne Marriott Hotel are situated a short distance from the Melbourne Zoo. The Park Hyatt Melbourne is 3 kilometres (2 miles) away and the Melbourne Marriott Hotel is 3 kilometres (2 miles) away. Check out the Apartments @ Docklands as well as the Crown Towers. The Apartments @ Docklands can be found 3 kilometres (2 miles) away from downtown Parkville. The Crown Towers, is located 4 kilometres (3 miles) away. Other alternatives in the area include the Grand Hyatt Melbourne and the Docklands Private Collection of Apartments - NewQuay. 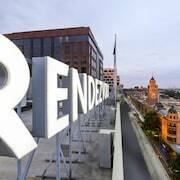 Looking for things to do? Consider spending a few hours discovering Puffing Billy Steam Train and Sherbrooke Forest, in Belgrave, 40 kilometres (24 miles) to the east of Parkville. The Clarendon Cottages and Coonara Cottage - Olinda are some of the Expedia-recommended long and short-stay options in Belgrave. 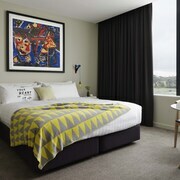 Alternatively, you could consider staying at Cheltenham, 20 kilometres (14 miles) to the southeast of Parkville, where you can choose from the Quest Moorabbin and Quest Cheltenham. While in Cheltenham, be sure to explore the Royal Melbourne Golf Club and Victoria Golf Club. Just because you are far from home, doesn't mean you can't enjoy your passion for sport. You'll find Melbourne Cricket Ground 5 kilometres (3 miles) to the southeast of Parkville. Sleep near the action at the The Westin Melbourne or the The Langham, Melbourne. Tullamarine Airport is a convenient airport, and is located 16 kilometres (10 miles) from Parkville. 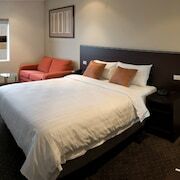 Accommodation options nearby include PARKROYAL Melbourne Airport and Holiday Inn Melbourne Airport. What are the most popular Parkville hotels? Are there hotels in other cities near Parkville? 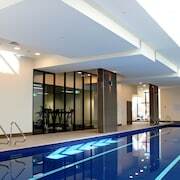 What other types of accommodations are available in Parkville? Explore Parkville with Expedia.ca’s Travel Guides to find the best flights, cars, holiday packages and more!